Research • Cost-effective treatment alternative could spark memory, stave off feelings of loneliness and depression. Steve Griffin | The Salt Lake Tribune Jaime Hansen, Hospice Lead Team case manager for Intermountain Home Care and Hospice, listens to music with Helen Cox, who suffers from Alzheimer's, at her Magna home. A number of nursing homes, home care services and other programs have adopted the "Music & Memory" program that was highlighted in a documentary last year at Sundance Film Festival. Steve Griffin | The Salt Lake Tribune Amanda McPeck, a volunteer for Intermountain Home Care and Hospice, listens to music with Helen Cox, who suffers from Alzheimer's, at her Magna, Utah home in July. Alzheimer's and dementia patients in Utah are listening to the music of their youth in part of a program to help them cope with the anxiety, loneliness and grief related to their conditions. Some patients are listening big band jazz, while others choose funky tunes or soothing sonatas. A number of nursing homes, home care services and other programs have adopted the "Music & Memory" program that was highlighted in a documentary last year at Sundance Film Festival. Alzheimer&apos;s researchers at the University of Utah are studying what they say is an ancient but underutilized treatment. Listening to music is inexpensive, with no side effects. And it may help aging patients with fading memory fight the loneliness, depression and anxiety that often accompany Alzheimer&apos;s disease. "Our hypothesis is that meaningful sound will activate parts of brain damaged in Alzheimer&apos;s disease," said Norm Foster, director of the Center for Alzheimer&apos;s Care, Imaging and Research at the U. "That would be a wonderful and important result, if we can show it." Foster and a team of researchers are handing patients iPods loaded with personalized playlists and helping them into MRI machines. Not just any tune will do. Participants select songs with personal resonance  ones they may have heard at a prom, their wedding or a favorite childhood musical, for example. Researchers specializing in geriatrics, and family members grappling with loved ones&apos; difficult diagnoses believe the tailored playlists can stave off the symptoms of the disease, as well as the isolation and frustration that often come in its wake. There is no known cure for the progressive neurological disorder, which usually strikes after age 65. The research team at the U. has begun tracing the brain activity of four subjects using the iPods. Though the findings won&apos;t be public until summer, some participants already are appreciating the treatment. One asked hospital staff to pause the noisy MRI scan to get a better listen through headphones. Utah&apos;s Alzheimer&apos;s and dementia patients don&apos;t have to sign up for the program to receive similar services. Intermountain Healthcare and Jewish Family Service also personalize iPods based on patient request. But the number of participants is limited to the number of donated iPods and headphones or speakers they receive. The approach is also becoming popular nationwide. 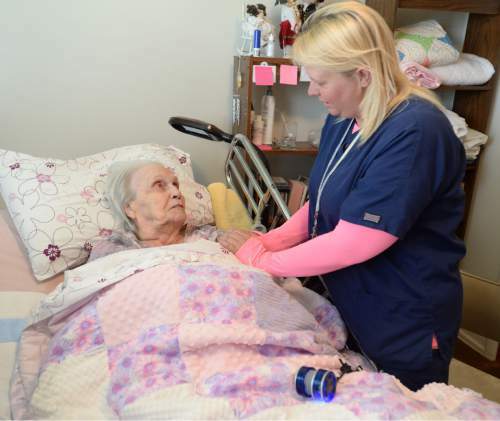 Similar programs are underway in nursing homes across the U.S. and Canada, in the model of New York-based program Music and Memory. The program, founded in 2006, was showcased in the documentary "Alive Inside" that debuted at the 2014 Sundance Film Festival. The attention has highlighted the importance of tailored selections. Listening to an orchestra does not jog memory or stir emotions in the same way, Foster said, as hearing the ditty that Mom or Dad used to hum around the house. In Utah, show tunes, especially from the mid-century hit "South Pacific," are the most popular choices, Ellen Silver, who directs the Jewish Family Service program, has said. But some prefer gospel or soul. 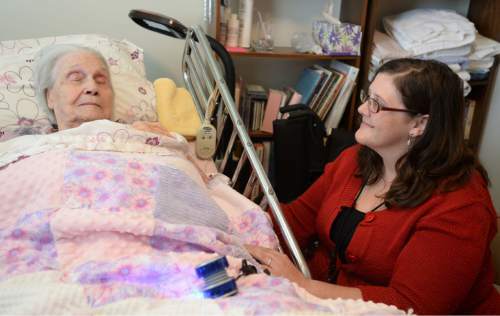 Selections from the "The Sound of Music" or "Oklahoma" offer "sweet respite" for 91-year-old hospice patient Helen Cox and her daughter Laura Groll. The great-grandmother of 50 received a free iPod Shuffle from Intermountain Healthcare Homecare and Hospice. At home in Magna, she occasionally sings for guests, lighting up at the tunes sung by the Von Trapp family. "They calm me down," said the former church choir soprano. "I sing &apos;em when nobody else is around." During one family visit, her daughters were able to name the "Oklahoma" actor Shirley Jones, Groll said, but could not recall her male co-star. "My mother paused and said, &apos;Oh, that&apos;s Gordon MacRae,&apos; " Groll said. "That&apos;s back there in her memory bank. At other times, she just kind of shuts everything there and there&apos;s no life there." The U. is not the only university to study the effects of music on the brain. Similar research has been done in Wisconsin. But the Utah neurologists hope to get a more detailed picture of which parts of the brain are firing and connecting during the songs. "We&apos;re trying to move beyond taking just snapshots, " and trace the activity with multiple images instead of just one, said researcher Jeff Anderson. The findings may apply to a wider group, as the insights may also be helpful for people with brain trauma. The U. research is paid for by Zions Bank CEO Scott Anderson, who wanted to see more data on the approach after watching the film "Alive Inside," though researchers declined to say how much it costs.